Cannabidiol (CBD) is found in marijuana along with tetrahydrocannabinol (THC) and other 85 substances known to science. By itself, CBD does not possess the psychoactive properties for which THC is responsible. That is, its use does not entail changes in consciousness or perception. However, using Cannabidiol allows you to calm down and get rid of unwanted panic attacks. The first studies of cannabidiol were conducted in the 1940s in the United States by the scientist Roger Adams, who was engaged in the research of plant alkaloids and fats. Thanks to science, during 32 years many medical properties of CBD have been discovered. Clinical studies demonstrate that cannabinoid can resist spasms, convulsions, epileptic and mental attacks, has anti-inflammatory properties, and also inhibits the development of cancer cells. Cannabidiol affects the CB1 and CB2 receptors in the body, being their antagonists. If THC is an agonist and “turns on” the receptors, CBD suppresses their work by removing the negative effects of marijuana. Besides, cannabidiol acts on opioid receptors. It was found by scientists from ISMMS in New York, who cured rats of heroin addiction with food that added cannabidiol extract, while the other rats who did not receive the medicine were looking for a dose. The medical properties of CBD were first discovered in 1985. A patient with Parkinson’s disease was treated with a cannabidiol-based drug. As a result, the drug proved to be effective for controlling dyskinesias – disorders of the human motor functions. In 2012, Brazilian medical scientists from the University of São Paulo and the National Science and Technology Institute for Translational Medicine in Brazil (INCT-TM) provided a report declaring that CBD prevented experimental psychosis and is effective in clinical trials in schizophrenic patients with a remarkable safety profile. Research conclusions support the idea that cannabidiol oil may be used as an antipsychotic for the treatment of schizophrenia in the future. Moreover, the drug was effective in the treatment of epilepsy. Dr. Kevin Chapman, associate professor of neuroscience and pediatrics at the University of Colorado, in December 2017 analyzed patients who have epilepsy, whose average age was seven years. 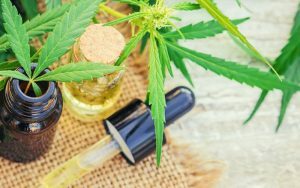 The scientist found that one-third of patients who use CBD oil felt an improvement and the number of seizures decreased by 50% or more. The use of CBD oil for cosmetic products such as anti-inflammatory creams and skin care products has recently become very popular and gives excellent results in user reviews. Side effects when using cannabidiol were observed in 47% of cases: in 21% of seizures became more frequent, in 14% fatigue and drowsiness appeared, and only 10% had regression of the disease. The report of the California Pacific Medical Center in November 2007 stated that a patient with breast cancer had a decrease in the spread of metastases. According to the report, cannabidiol blunted the work of the ID1 gene responsible for the formation of metastases. In addition, it turned out that the drug is an antiseptic that can suppress methicillin-resistant Staphylococcus aureus. This bacterium causes diseases such as sepsis, infective endocarditis, and pneumonia. It is sufficiently resistant to most antibiotics.